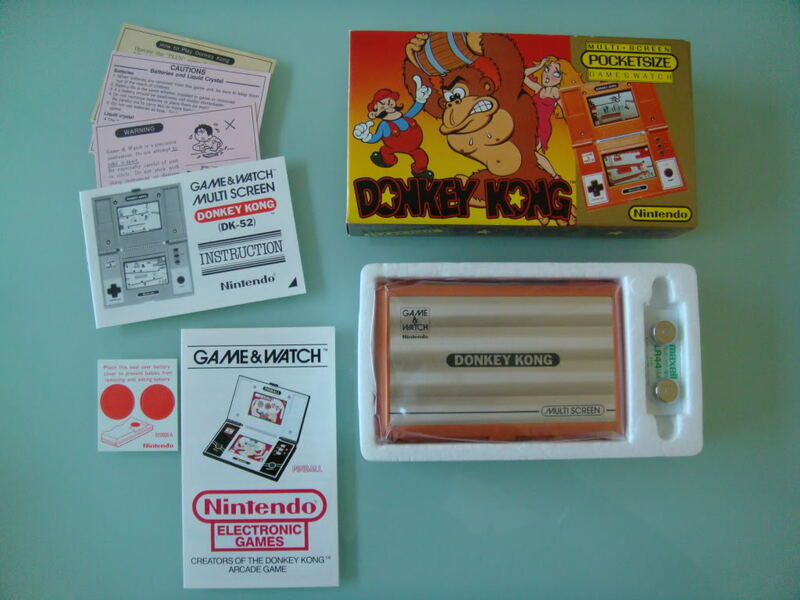 I couldn't help but think of Famicomblog proprietor Sean upon seeing this morning's addition to the Retro Treasures blog, which turned followers on to an eBay auction for a complete-in-box Donkey Kong Pocketsize Game & Watch system. That said, I can't see Sean handing over the kind of cash that's surely going to be needed to win this particular auction. After all, the bidding's already up to £720 (approximately $1,120) and the auction doesn't end until around this time on Thursday. All of this could be yours for $1,000 (or more)! Although I'm sure that's way more than anyone reading this post is willing to spend on such an item, the eBay listing (here) is still worth a look if you're at all interested in Nintendo's Game & Watch products--especially since it includes a number of additional photos of the system taken from different angles. Boy. Wonder how those lucky guys who had the foresight to keep their games in tact are feeling. Cool. It will complete my collection of seven of them. And I'll still have money left over for a mansion to put this one in! Thanks for the mention, Bryan! 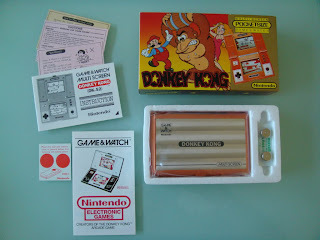 I did, in fact, pay a whopping 4$ for my Donkey Kong Game and Watch, which works fine;) That is about 1/250th the current bid on that one. I really don`t understand why people would pay so much for that though. Well, I understand that it is the collector market driving the price up, etc etc. But I`m sure one could buy a nice CIB copy of that same thing for about 100$-200$, the only difference being that the batteries don`t come in their original plastic. And that would be just as nice to display. I'm guessing yours wasn't CIB, though, right? Even so, like you said, I'm sure a nice CIB version could be had for much less than $1,000. As for why people pay enormous amounts of money for sealed copies of old games: I couldn't tell you, Sean. I'm sure it has something to do with collecting, but that's as far as my understanding goes. Wow totally crazy price that game and watch is going for. AHHHHHHHH!!! Adam: If only you'd kept it in its box and in pristine condition! Of course, you probably had a lot of fun with it, which, if you ask me, is just as good (if not better) than never playing it and selling it for $1,000 20-some years down the road. LOL, yes, my 4$ copy isn`t CIB! I can see paying more for one that is complete, in Japan they go for about 150-200$ CIB at Mandarake, which I could see paying if I had a ton of money (er, and hadn`t just bought one for 4$). Also, as a collector I understand why people would pay a ton of money for some stuff. Like that Air Raid game for the Atari 2600 which there are only about 14 in existence. Its one of those holy grails and it is natural that so many collectors of that system want it. But the huge premium just for an intact plastic label I don`t understand at all.